For at least the past year & a half, I have been privy to the many uses of crystals. Crystals can be used to heal on a physical and spiritual level by balancing the energy imbalances in ones aura. Crystals not only carry energy of their own but they are an amplifier of the users energy and intentions. I have been interested in the soul-healing energy of crystals ever since the knowledge of their metaphysical power and awesomeness was first presented to me. I am by no means a crystal connoisseur but I am learning more and more about individual types of crystals and their special individual uses each day. Recently, Wood Merkaba kindly sent Triiinity & I some beautiful additions to our budding crystal collection. You know, it is said by many that crystals pick where they want to go (choosing their owners and choosing when they are ready to leave them). Well when Triiin went to the Wood Merkaba store site looking for pieces, the Flourite ring, whyy this baby just opened up its link without even being clicked on. I came in the room and she showed me the site asking me (without telling me what happened) to pick the pieces that appealed to me and I picked this very piece. So we decided it was destined, the flourite ring had picked us! When we read up on the properties of flourite, we found that flourite is a multidimensional gemstone (associated with the 3rd eye & crown chakras) that cleanses & stabilizes the aura, advancing the parts of the brain that connects us to Source. It balances and gives order to the energies removing chaos and disorder from ones environment. This awesome crystal gives clarity on situations where you need to see unbiased truth past the illusion or emotionally clouded judgement. Flourite also offers powerful healing and protection (especially on a psychic level). This was crazily spot on, in the fact that we had been thinking about getting a crystal for protection, especially against psychic manipulation, but did not know which crystal would be best. Not to mention needing clarity to make sound, unbiased decisions in our personal and business lives while ordering our environment and strengthening our connection with the I AM. Perfection. Wood Merkaba added in another piece for me, that truly makes me feel as though she read my energies from afar. The Rhodonite pendant. Rhodonite is a stone of love which, through steady uplifting vibrations, helps one to stabilize their emotions, deepens one’s understanding, and matures one to meet life with balance and grace. It strengthens the understanding of unconditional, universal love past our concept of conventional love. It is associated with the heart chakra and increases self-love and love for all of creation. Though it is not necessarily associated directly with the astrological sign Leo (my astrological sign & a fire sign), rhodonite is said to resonate with fire energy. Also, though I am a very loving being, I also can be as fiery in my emotions as I can be kind and altruistic. Rhodonite is here to give me more balanced emotions and increase my love for self and the world to the level it needs to be to spread love on a mass level and exact my purpose to spread positivity and peace among the Earth. Also, Rhodonite is said to help with anxiety, which at times, Triiin mildly battles with. Jessica Miller, the angel behind Wood Merkaba, is a Certified crystal healer and makes beautiful wearable crystal pieces. It is clear that she charges, cleanses, and blesses the her crystal pieces before sending. Upon receiving these beautiful babies we could feel their fully charged, cool hum of power. When I put the copper plated flourite ring on my finger I could immediately feel powerful energy coursing around and through my finger. Talk about, WOW! 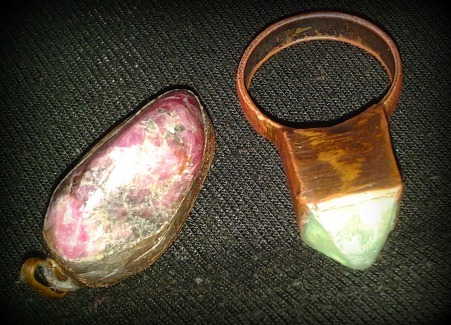 Holding the Rhodonite pendant in my hand and stroking it with my finger, I could feel the energy emitting from it as well. Upon wearing the pendant out into life, I found my emotions to be more balanced in situations where I would have normally been riled. Its crazy how real the soul-healing powers of crystals, really is! I feel as though I was at least slightly more patient than normal and better at expressing love in tense situations. I am presently wearing it on a gold chain but I really want to get a copper chain for it. Copper is a great conductor of energy , the best (dare I say), which is why many crystals pieces are made with copper in, on, or, around the crystal. As someone who does not use over-the-counter or prescription medication and wholly advocates natural methods of healing, I love using crystals as a part of a holistic healing plan for my mind, body, & spirit. These two beautiful pieces are already making wonderful additions to our budding crystal collections and I will continue to observe our progress in the areas these crystals pieces were created to aid. Do any of you have experiences with flourite or rhodonite?? If so, share, Share, SHARE!!! Check out WOOD MERKABA for beautiful & powerfully charged, wearable crystal pieces. Also check out the WOOD MERKABA Etsy Shop & Instagram page. For more information on Flourite click here, For more information on Rhodonite click here or here.